If you find yourself constantly installing themes or performing tasks where you are required to respring your iPhone, iPod Touch or iPad. A new tweak was released into Cydia called RespringIcon, which will add an icon to your SpringBoard that upon clicking, it gives you the option of respringing your iDevice. You even have the option of entering safemode upon clicking the RespringIcon tweak’s icon. Note: The UIAlertView which pops up when you click the tweak’s icon will go away after 5 seconds. RespringIcon is available through the BigBoss repo for free. If you have gotten bored of the default screenshot flash that happens when you hold down the home and sleep button, a new tweak was recently released into Cydia called Screenshot Customizer to change things up. With the tweak you can easily change the flash colour of your screenshots and even make them vibrate upon taking a screenshot. Allowing you to customize the screenshot taking process to your liking. Additionally, you can even set pattern animations when you take a screenshot. 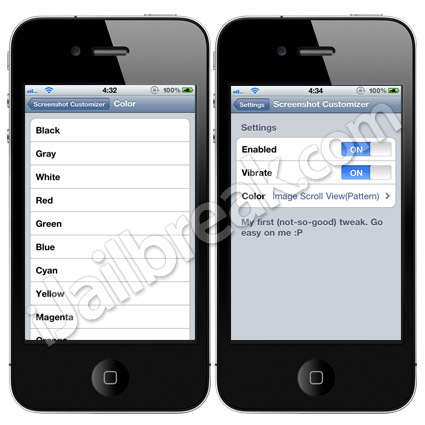 If you are interested in Screenshot Customizer it is available through the BigBoss repo for free. 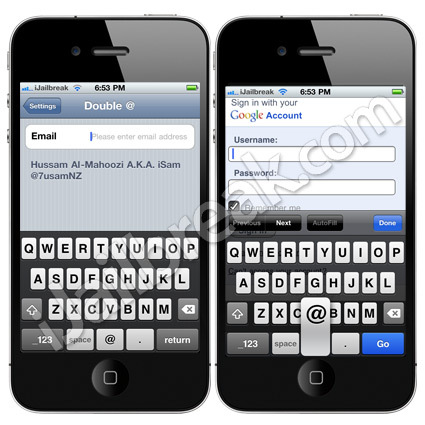 Double At is a new Cydia tweak that allows you to quickly insert your email address anywhere throughout your iDevice that requires it by simply double tapping the @ key. You can set your email address by going into the Settings.app, and once your email address is set, whenever a webpage or app requires you to enter your email address simply double tap the @ key. The tweak is an example of a very simple tweak that can help a lot with productivity and ease-of-use. If you are interested in Double At it is available through the BigBoss repo for free. iPod Memos is a simple tweak that was released into Cydia that will add an ‘Add To iPod’ button in the VoiceMemos.app’s details view. This will allow you to listen to your recordings directly from the iPod.app instead of having to launch the VoiceMemos.app. A very simple, but useful tweak I am sure anyone who uses the VoiceMemos.app will enjoy! If you are interested in iPod Memos you can find it through the BigBoss repo for free. My iPad thinks it’s an iPhone. I haven’t updated it in well over a year. I assume it’s from Cydia programs I’ve downloaded that aren’t compatible. Well now when I click on ANY app, my iPad restarts. I cannot go into safe mode to respring, and I cannot do anything but look at my icons and restart the thing. Any help with my situation would be amazing. ﻿ Factory resetting is not an option at this time (too much saved on there), so a successful backup would open up that avenue. PLEASE HELP! !